Nervous system. Computer artwork of the nervous system in a body outline. The central nervous system (CNS), comprising the brain and spinal cord, is coloured white. The spine is shown around the spinal cord, and is coloured magenta. 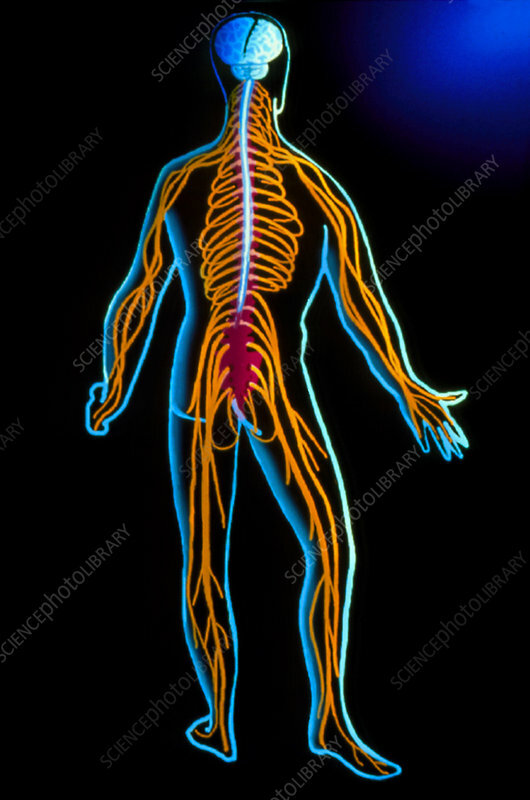 The spinal nerves, those which extend from the spinal cord, are coloured orange. The spinal nerves collect information from every part of the body, and relay it to the CNS. The CNS makes decisions based on this information, and sends signals back to the spinal nerves for appropriate actions to be performed.